Guess the Problem in This Photo! In 2001 while working as a property manager in the Riverland of South Australia, I had a great tenant who really looked after the home, paid his rent on time and wasn’t a problem at all! However, he went overseas for a few months and sub-let the property to his daughter and her boyfriend while he was away (all without our knowledge). After this (as you can predict) the tenancy went downhill rapidly, rent not being paid etc. The daughter then moved out leaving the boyfriend in the property and by the time we could get legal possession through eviction, the house was nothing but a mess! 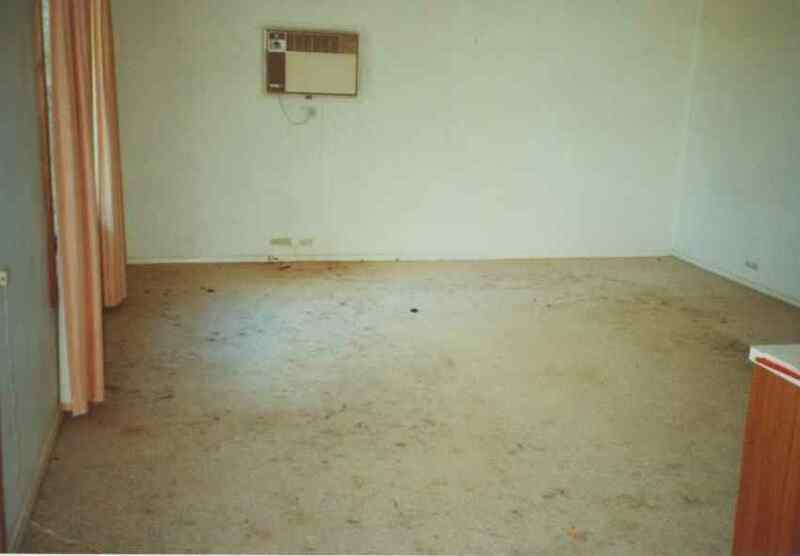 After the rubbish was removed and before cleaning was to commence, we took this photo of the lounge room. Our focus is on the carpet. Can you tell what the markings on the carpet are caused by? I have had property managers call me, email me, Facebook me, begging for an answer! I also had various training sessions recently people approaching me asking what was on the carpet! We received so many answers. Thanks so much for a great laugh! Some of you have very creative answers (and fertile minds!) and we appreciate your input! The answer is simple – it’s Dog Hair! The reason this is my most unusual photo is that when I was working as a PM, to get good photographic evidence of pet hair on a carpet I would have to get my camera literally inches from the carpet to take a shot and even then it didn’t come out very well in the photo. Pet hair is hard to see in a photo. However this photo was taken from the back of the room and you can see the dog hair metres away, there was so much of it! It had to be literally ‘raked up’ and well vacuumed out before the carpet cleaners could do their job!